Slipcovers are a great way to keep your furniture looking new and clean especially if your living room is home to pets, kids or frequent spills and messes. Simply remove the slipcover, follow the cleaning instructions and you are able to keep your furniture looking newer longer. Large in size with plenty of seating for all, this sectional sofa allows you to transform your living room. A great way to fill your open concept floor plan, this sectional features a chaise on one end to stretch out. 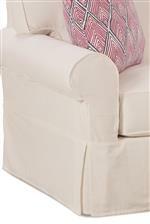 With a slipcover you can achieve a cottage or coastal style for your inviting home. 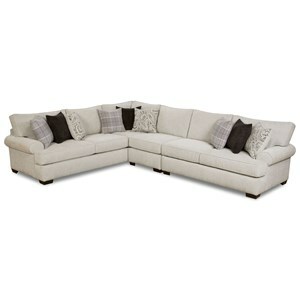 This sectional sofa features rolled sock arms on either side and welt cord trim along the seams. The Easton Casual Sectional Sofa with Slipcover by Rowe at Thornton Furniture in the Bowling Green, Alvaton, Glasgow, Scottsville, Franklin area. Product availability may vary. Contact us for the most current availability on this product. P275-119 Left Seated 3-Seat End W/Corner W/Slipcover 1 100" 42" 39"
P275-110 Right Seated Chaise End W/Slipcover 1 40" 70" 39"
P275-041 Large Armless W/Slipcover 1 65" 42" 39"
Arm Rolled sock arms with welt cord trim. Leg or Skirt Slip cover covers feet/base. Wood & Finish Leg finish options are Espresso, Chestnut, Washed Pine, Chocolate, Latte, Pebble, Pearl. If finish is not specified, the most popular finish, Espresso will be selected. Frame Construction We use kiln-dried hardwood solid and laminate boards that are precision-milled to make a solid frame, one that won’t twist, warp or crack. Joints are held solid with mortise and tenon or double-dowel and corner block construction. These construction techniques give us confidence in offering a lifetime warranty on our frames. Padding & Ergonomics Each of our four cushion types is designed to provide the perfect balance of support and comfort for both seat and back. Our cushion cores are made with eco-friendly, high-resiliency foam and are wrapped with a polyester fiber wrap for surface softness and shape. Casual, cottage or coastal style can be achieved with this stationary upholstery collection. Update your open floor plan or large living room with a sectional or choose a sofa to transform your home. Pieces from this collection feature slipcovers for an inviting look. The Easton collection is a great option if you are looking for Casual Cottage Coastal furniture in the Bowling Green, Alvaton, Glasgow, Scottsville, Franklin area. Browse other items in the Easton collection from Thornton Furniture in the Bowling Green, Alvaton, Glasgow, Scottsville, Franklin area.